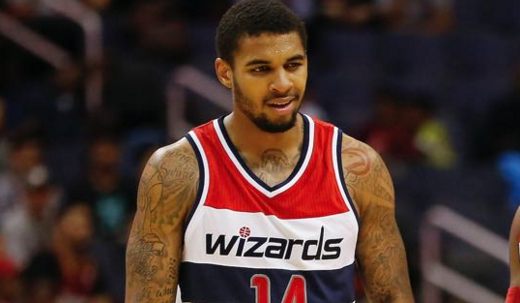 Glen Rice Jr. Shot During Gunfight at Restaurant Owned by T.I. I’m not sure T.I.P. had this in mind when he decided to open an upscale restaurant in Atlanta. Glen Rice Jr., the son of former NBA All-Star Glen Rice, was shot in the leg Sunday at the rappers restaurant in downtown Atlanta, according to WTOC. An employee at the restaurant told police the men involved in the fight were asked to leave the restaurant. They then took their fight to the parking lot. After another man shot him, police said Rice tried to leave the scene. Police said he dumped the revolver, which came up as possibly stolen, in a staircase near the restaurant and got into a Porsche with another man. The driver of the Porsche took Rice to Emory Hospital, where he got out and laid on the ground. Police said a backpack found near the Porsche contained 240 grams of marijuana, about $5,900 and the revolver. The officer said they ran the serial number and it returned as stolen from Chattanooga, Tenn.
Rice, Jr., who is reportedly the son of NBA great Glen Rice, was taken to Grady Hospital for treatment. Rice, Jr. faces charges of reckless conduct and possession of marijuana. Rice Jr. is in pain, out of his weed and money, while likely ruining any chance he had of getting back into the NBA.